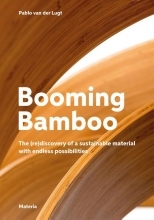 `Booming Bamboo` provides a comprehensive overview of the enormous potential of this sustainable resource. Not only for architecture and design but also for a multitude of other applications. After covering the `bamboo basics` (growth, properties, cultural history, industrialisation), the first part of the book introduces the many benefits of bamboo as a fast-growing, renewable resource. The second part presents the various ways in which bamboo can be transformed into many different exciting materials and fabrics.